This guide will help you find several interesting locations and tell you what you can expect to see there. I will start at the border between Wyoming and Colorado and head as far south as Denver. The text is written with the assumption that the reader has at least a basic knowledge of American railroading. The information given here has been acquired during about ten trips in approximately the same number of years. A lot has changed during this time frame and I have only used the most contemporary information when I have had multiple choices. Get a good map. The best one you can get is COLORADO ATLAS & GAZETTEER published by DeLorme Mapping. The map shows essential details such as railroad yards and sidings. Treat railroads with respect. Railroads are dangerous places and the need to pay attention to safety can not be overstated. Railroads are private property and trespassing is not allowed. If you feel you need to be on railroad property you should always ask for permission first. If permission is granted, behave responsible and pay strict attention to safety. Most railroaders are friendly and helpful if you have the right attitude. Behave in a manner so that you and other railfans will continue to be welcome. It is helpful to have access to a scanner but it is not essential. The BNSF line north of Denver is a dark railroad (no signals) and track warrants will be given by radio. Here the scanner will be helpful as well as around Denver. The UP line between Cheyenne and Denver has signals and the radio traffic is limited. I have given some milepost (MP) locations in the text which will help you locate trains when you listen to the scanner. The former C&S line between Denver and Cheyenne normally sees two daily trains each way running between Texas and the Pacific Northwest. The consist in these trains are made up of containers and trailers in addition to general merchandise. You will also see interesting freight cars with airplane parts between the Boeing plants in Wichita, KS and Seattle-Tacoma, WA. In addition to these long distance trains a coal train is running from the Powder River Basin coal fields in Wyoming to the Rawhide Power Plant north of Fort Collins. The coal train run about three times a week and leave the mainline at Platte River Jct (MP 96.3). 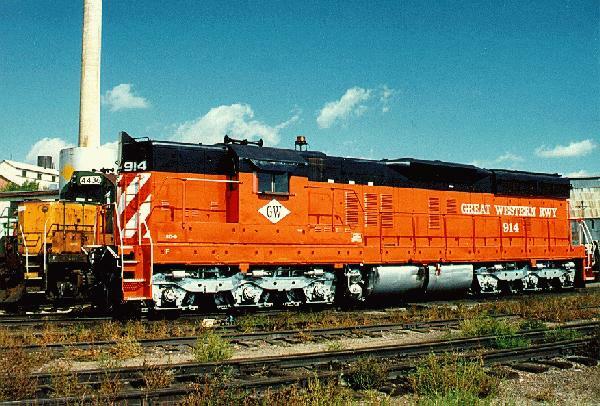 The power for this train is usually made up of four SD40-2 with a fuel tender spliced in between the middle units. The coal hoppers carry the reporting mark RAWX. A local (which sometimes is referred to as the Fort Collins turn) is running every day between Denver and Fort Collins' North Yard. Note: Recent information (Summer 1997) has indicated that the local now runs between Denver and Cheyenne. The Budweiser plant north of Fort Collins has added a lot of traffic to this line. The local is also setting out and picking up cars in Longmont. Here you want to catch a train and the state line sign. Opportunities are a bit limited as only eastbound trains (running geographically south) before noon will produce a good photo. You can reach this siding by leaving I-25 at exit 293 and go west on 29 RD . The siding is located in shallow cut and trains can easily be photographed here in the morning with the Rockies in the background. The junction where the coal trains from Powder Riwer Basin in Wyoming leave the main line for the Rawhide Power Plant. This siding was formerly named Bulger and is located right along the west side of I-25. You must leave the car on the shoulder of I-25 if you are going to photograph here. This is not really recommended and should only be attempted if you are going south on I-25 pacing an eastbound train. Leave I-25 at exit 278 and go west on State Route 1 to Wellington there you will cross the BNSF mainline. A couple of elevators east of the tracks will provide a nice background for afternoon/evening shots. The Budweiser plant is located east of the BNSF main, north of Mountain Vista Road and south of 52 RD. Good opportunities for photographing trains exist at both road crossings. Free plant tours are available - a nice way to kill time if the weather is unsuitable for railfanning. The yard is located northeast of Fort Collins along Vine Street. A switch engine (usually a GP39) is located here and handles the traffic to the Budweiser brewery as well as the interchange with UP in Fort Collins. Here you can see lots of 50 ft RBL box cars and 57 ft mechanical reefers used for hauling beer. I have seen some older 50 ft cars here still in their original Northern Pacific livery. Covered hoppers containing grain for Budweiser can also be seen here. In addition to railroad owned cars such as BN, CNW, SP and SSW you can see privately owned cars like Lincoln Grain. North Yard features one of the two longest sidings (7295 ft) between Denver and Cheyenne. Meetings are fairly common at North Yard and are interesting to watch. If you are equipped with a scanner or have obtained information from a friendly agent at North Yard you can get the westbound train on Mason Street in Fort Collins, the meeting at North Yard and catch the eastbound entering Mason Street. The most interesting scene here is the street running on Mason Street. BNSF trains go both ways on Mason but for automobiles the street is restricted to northbound traffic only. Lots of possibilities for nice shots all along the street and maybe especially where the tracks turn east towards North Yard at Cherry Street. This is also the location of the grade crossings with the former Greeley branch (owned and operated by GWR since June 1996) and the UP branch to Boettcher. If you are lucky you can work in both a BNSF and an UP train in the shot. The best chance to do this is sometime between 4 and 6 in the afternoon. A Taco John is located here enabling you to have something to eat without losing control over the activity. The distinctive old C&S freight house is located east of Mason Street. I have taken a large number of real nice photos in this interesting part of Fort Collins. BNSF interchanges with UP in Fort Collins on a few tracks which are easily accessed from Linden Street and Lincoln Street. Many nice photos can be obtained here. Ranch-Way Feeds is still switched by BNSF although the former C&S branch to Greeley is in the hands of GWR since June 1996. Not much of the yard remains in place but it is easy to see where it has been. A siding is still in place and used regularly. The distinctive Loveland elevator is located west of the track and the beautiful depot is sitting on the east side of the track just south of where the track connecting BNSF to GWR branches of to the east. Berthoud is considerably smaller than Loveland and Longmont. Trains rarely meet here so you should only expect to catch a train rolling by. An elevator is located here as well as a wooden depot. The depot is now painted blue and yellow. The yard in Longmont is in the shape of a wye with the west leg connected to the Denver mainline. The beautiful former C&S depot is located north of the tracks just east of Main Street. The old CB&Q depot is located on the west side of Main Street and has served different purposes since CB&Q no longer needed it. Today it is used as a Mexican food store. The north leg of the wye is the mainline towards Wyoming. The track is located in the middle of Atwood Street. Very interesting and photogenic. The east leg of the wye serves as a connection to the GWR interchange and a small yard next to the wastewater plant where the old CB&Q line from Denver used to enter Longmont. The interchange with GWR is mostly used for covered hoppers to the bulk sugar storage facility located at the former Great Western sugar factory. The old CB&Q branch towards Lyons is still in use serving a gravel pit and a small cement plant just east of Lyons. If you get hungry in Longmont excellent Mexican food can be obtained at the La Mariposa Restaurant on 1240 Ken Pratt Boulevard (Diagonal Highway 119). A few attractive buildings are located east of the mainline and can be worked into the photos. Trains go by quickly so set up for your shots in advance. The University of Colorado gives the city of Boulder an interesting character. The BNSF passes thru Boulder east of downtown. The former C&S depot is located west of the track just south of Valmont Drive. Good photo opportunities are limited in Boulder. Traffic is heavy so do not expect to be able to chase trains in town. The town itself is certainly worth a visit. Park the car near Pearl Street, walk around downtown and enjoy the beautifully restored buildings. The 9777 ft long siding makes Broomfield a popular location for meetings. Eastbound trains are frequently held here when the yard in Denver is congested. Two old elevators of different design on the west side of the track provide a nice background for photos. Ask for a room on the third floor facing east towards the railroad yard and you will be satisfied. The motel is located between the BNSF (originally CB&Q) yard and Prospect Junction. It is easy to find near the junction of I-25 and I-70. The locals refer to this spot as the mouse trap. Avoid it during rush hour traffic if you can. BNSF run trains to Golden three times a day to serve the huge Coors brewery. The trains leaves the BNSF yard, turns north and pass thru Prospect Junction, at Utah Junction they enter the ex-DRGW Moffat line and leaves it again at C&S Junction (just west off Federal Boulevard). The BNSF intermodal terminal is located directly east of the ex-DRGW North Yard. This place can be observed from the 48th Avenue viaduct just north of I-70. Golden is home to the Coors brewery and the Colorado Railroad Museum. The brewery fills a large portion of the valley and has its own railroad operated by a fleet of switchers. It is common to see between three and five switchers in operation simultaneously. BNSF has small yard and car repair facility in Golden. The area is very scenic and nice photos can be obtained here from public property. Be sure to park your car safely as the road is narrow and the traffic is heavy. This is just right next to the Colorado Railroad Museum which you should visit. Nice collection of equipment in a beautiful setting. The gift shop at the museum offers an excellent selection of books. This railroad was originally built by CB&Q and can easily be followed by taking I-76 north out of Denver towards Fort Morgan. Good photo locations can be found in Commerce City, Irondale, Hudson and Fort Morgan. Continue east to Brush. East of Brush coal trains from Wyoming will enter the line via trackage rights on UP. BNSF keep a switcher (usually a GP39) at Brush which is used for switching and locals. Follow U.S. Route 34 east along the BNSF line. Good photo opportunities are to be found at Akron, Otis (try to get the classic water tower into the shot), Yuma and Wray. An excellent guide to this line has been written by Donald K. Park II and is published by Parkrail in Fort Collins, Colorado. The booklet includes maps, route profiles and other essential information. The easiest way to get hold of a copy is buying it at Caboose Hobbies. The Joint Line is very scenic and some of my favorite spots include Sedalia, Castle Rock, the bridge at Larkspur and Palmer Lake. Plan to spend at least one day exploring the Joint Line. UP's line between Cheyenne and Denver is home to a couple of daily heavy freight trains carrying a wide variety of merchandise. A fairly large yard is located at La Salle, about halfway between Cheyenne and Denver. Considerable amounts of grain from Iowa and other midwestern states comes to La Salle destined to Monfort feed lots in the area. The Budweiser plant north of Fort Collins is located on the BNSF but most of the beer goes out on the UP. UP's Fort Collins local has been a seven days a week operation for several years but since 1996 it normally runs only on weekdays. The local is normally powered by two GP38-2's. The consist is normally made up of empty cars to Fort Collins (reefers for Budweiser and cement hoppers for the cement plant located at Boettcher) and loaded cars back to La Salle. A pipe treatment plant located on the southeast side of town receives and ships pipes of different sizes on bulkhead flats cars and in gondolas with road names like CR, CSXT, NS and N&W. Interesting looking grain elevators are located here and provide a nice background for shots, especially in the afternoon/evening. Industries here include an active grain elevator and an abandoned sugar factory. An attractive brick depot is located west of the mainline in downtown Greeley. Interesting warehouses and elevators are located on both sides of the tracks north of the depot. 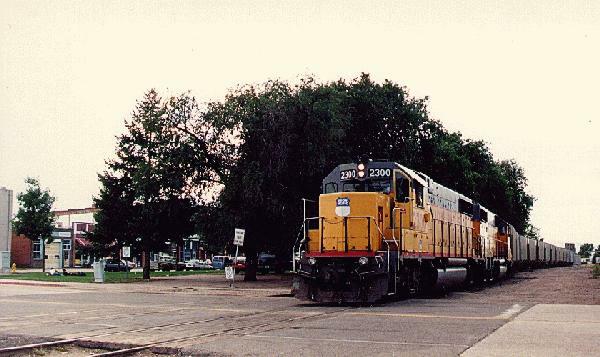 The former C&S branch from Fort Collins which is operated by GWR since June 1996 enters Greeley at a wye on the UP at the north end of town. The GWR tracks runs parallel towards south along the west side of the UP line. Be sure to visit Don's Hobbies located a few blocks west of the UP tracks while you are in town. This is the most interesting town on the UP between Cheyenne and Denver. The old depot has been saved and relocated to a small park east of the mainline and have been joined by a caboose. Two sets of power are based in La Salle. One set is used for the Fort Collins local and the other for switching and taking grain to Monfort feed lots in the area. The UP yard office is located east of the tracks and south of the city water tower. Some interesting cars like a MoPac caboose and a couple of old 40 and 50 ft box cars can be found here. A very attractive feed mill is located west of the mainline at 404 North Main Street and deserves a couple of photos. The UP yard in Denver is located about two miles from Union Station. In the morning the best shots can be obtained from Blake Street just west of Downing Street. In the late afternoon and evening the light condition will favor photographing from Wazee Street. Wazee Street is a tiny street near the intersection between Brighton Boulevard and 38th Street. Today most of the UP traffic to and from Denver goes on the Cheyenne line. UP has started upgrading the ex-KP line towards Kansas. Longer sidings will be installed to increase capacity and traffic will increase on this line. The UP-SP merger will probably also provide more traffic for this line. 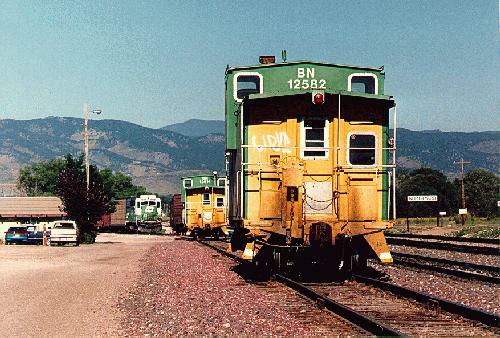 The smallest but most interesting railroad in northern Colorado is the Great Western Railway headquartered in Loveland. Railroad construction started in 1901 with the purpose to serve the sugar industry in the area. Sugar refineries on the GWR were located at Loveland, Longmont, Windsor, Johnstown and Eaton. None of these are in operation now but the silos at most of these plants are still used for storage of bulk sugar. GWR is owned by OmniTrax and the traffic on the GWR is more diversified today. Great Western's motive power is an exciting collection of well maintained first generation EMD's. The most recent examples are two ex-SP SD9's beautifully restored in GWR's attractive paint scheme. A day spent at the Great Western can be extremely rewarding. The best way to start is to head for the office located at 950 Taylor Avenue which is right in the middle of the yard in Loveland. Proceed directly to the office and ask for information. Suggest you show up between 8 and 9 in the morning. If you desire to be on GWR railroad property you should be prepared to sign a release form. The railroad is friendly and fair towards railfans. Do not misinterpret the staffs relaxed attitude. They are professional railroaders and will not tolerate visitors which create a safety hazard or interfere with operation. It is easy to find the GWR yard in Loveland. Just look for the tall white sugar silos. The yard is located south of Eisenhower Boulevard (U.S. Route 34) between Monroe Avenue and Madison Avenue. The yard is switched from the west end and good photos can be taken from Monroe Avenue without entering railroad property. This is also the location of the old GWR depot which easily can be worked into photos. The track crossing Monroe Avenue connects GWR to BNSF. The most common cars in the yard are Airslide and ACF type covered hoppers in sugar service. In addition to cars currently in use you will find old interesting equipment like old cabooses, a couple of GWR tank cars and lines of old EMD locomotives waiting to be rehabilitated by the OmniTrax shop. UP's Fort Collins branch crosses the north leg of the GWR wye here and the two interchange tracks are used on an almost daily basis. The wye connects the GWR lines from Loveland, Windsor and Johnstown. You can reach the northwest corner of the wye by using the Kelim exit from U.S. Route 34. You can get to Windsor by taking 392 east from I-25. If you are approaching Windsor from Loveland you drive east on U.S. Route 34 and go north on road 257. Universal Lumber is frequently receiving lumber loads from the Pacific Northwest and the sugar silos are still used for storage which provide covered hopper traffic of sugar in and out depending on market conditions. 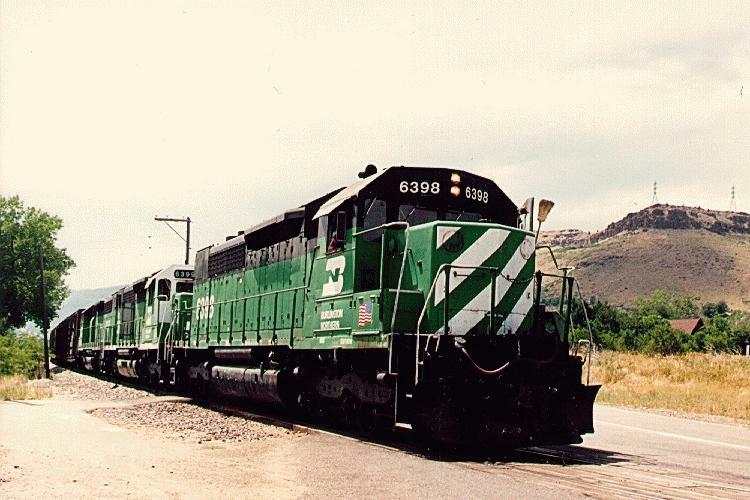 The C&S branch from Fort Collins to Greeley was acquired by GWR in June 1996. There is a large Kodak plant east of Windsor which is being switched by GWR seven days a week. The Kodak plant is manufacturing film from plastic pellets received in covered hoppers. The plant is also used as a distribution facility. Photographic paper and other Kodak products are received in box cars from the main Kodak plant in Rochester, NY. Do not attempt to enter Kodak property. Johnstown is a charming small town with one traffic light and several interesting industries. The largest is Golden Technologies (formerly Coors Biotech) which until recently was GWR's largest customer. Recent information (March 1997) indicate that the owners have decided to close down the operation. Johnstown Feed & Seed and Loomix are two other industries in town. A wye is located on the GWR line from Loveland to Longmont with one leg towards Milliken along State Route 60. The GWR line ends here in a couple of interchange tracks with UP. The line between Johnstown and Milliken has been used infrequently during the last years. During 1996 the interchange tracks were upgraded and large amounts of corn were transfered to GWR from UP for shipment to Golden Technologies in Johnstown. A small derelict grain elevator can be found here and is worth a visit. A HO kit of this structure has been manufactured by Rocky Mountain Model Works. If you are lucky you can still find a kit at Caboose Hobbies in Denver. You can get to Bunyan from Johnstown by going south on 17 RD and go west on 42 RD. Once again it is easy to find the GWR yard by looking for the tall white sugar silos on the east side of Longmont. Take 119 west from I-25 and you can't miss it. GWR usually keep an engine here for switching and handling the interchange with BNSF. The worlds largest train store is Caboose Hobbies in Denver. You will not only find an amazing selection of trains, accessories, tools, books and videos but also a very competent staff prepared to answer your questions. The staff is made up of model railroaders and railfans. They are usually more than willing to share the latest railfan gossip. Open 7 days a week. Caboose Hobbies is well equipped to handle international mail order. Another fine hobby shop in a northern Denver suburb is Mizell Trains. Good selection. Open 7 days a week. If you are in Greeley you should absolutely visit Don's Hobbies. This store has a very pleasant atmosphere and is worth a visit just to soak up the ambience. The train department is located in the basement and the selection is very impressive. A cool and quiet place to stock up on model supplies. An excellent place to get out of the sun for a spell while railfanning UP. During my most recent visit there I was impressed by their unusually good selection of Kato locomotives. Open 7 days a week.